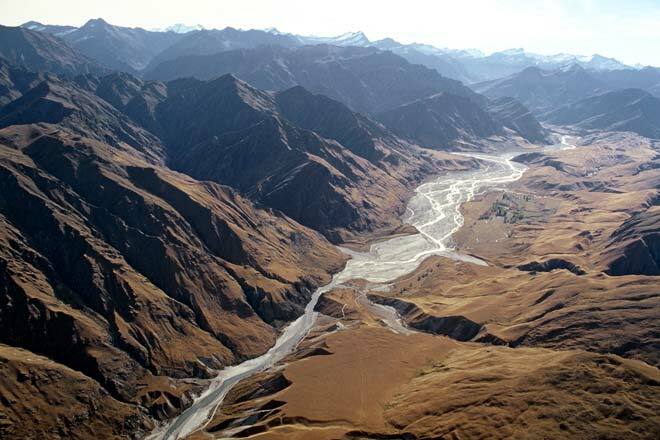 This aerial view of the Branches Station area of the upper Shotover valley shows the deeply weathered schist hills eroded by numerous creeks. The gravels are washed down to the main river and over time have a natural concentrating affect on any gold in the gravels. The rivers and streams effectively sorted the gravels so well that the first prospectors could get considerable quantities of gold with gold pans – usually used only for prospecting rather than mining.